Christmas has always been my favorite time of year! Baking Christmas Cookies, twinkling light displays, decorations everywhere, wearing my Santa Hat and fun Christmas socks, the sounds of Go Fish, Garth Brooks, the Nutcracker, or an awesome CD I got from Bath & Body Works (when I worked there about 15 years ago). I am one of those annoying people that walks around humming Christmas songs from Thanksgiving through New Years. I love Christmas shopping, in fact, the craziness at the mall actually energizes me! Yep, the Grinch, he hates me! Growing up, my Christmas celebration was always on Christmas Eve. My whole family would gather at my Grandma and Grandpa’s house, eat some food, hear my Grandpa read the Christmas Story from the book of Luke, and then have the madness which is about 15 kids ripping open presents as fast as they can. Once gifts were open, the sugar rush kicked in, and children would literally run in circles around my grandparents house until the parents had had enough, and took us all home. Ah… the memories!!! In the spring of 1997, my Grandma passed away. I was worried our Christmas traditions might change. Thanksgiving did, but Christmas stayed the same. This was a good thing, since our family really only saw each other once or twice a year. That same year, I started going to my future in-laws house for Christmas. Luckily, his family celebrated on Christmas Day. Around that same time, I had reconnected with my dad, so I went back and forth from the boyfriend’s to my dad, back to the bf’s other family. 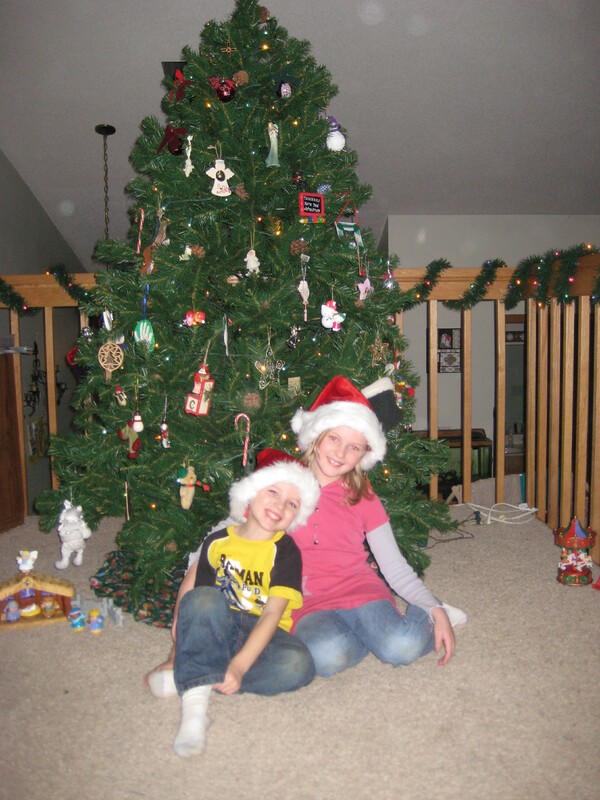 For a few years, Christmas was CRAZY! By 2002, I was no longer going to my Dad’s house, which took a lot of pressure off travel-wise…. Fast forward to 2009. I was newly divorced. I was also sick as could be with a BAD case of bronchitis! A snow storm was dumping on us. The last thing I wanted to do was drive the 2 hours to MN, all I wanted to do was sleep! I let the kids go early with their dad… It was eerie. For the first time in 32 years, I was not with my family on Christmas. The next day, I was still quite sick. This really awesome friend was also on his own for Christmas, so he came to take care of me. That was when Jason became my boyfriend. Here we are a year later, engaged to be married in July! The bummer thing about missing Christmas last year with my family, is that I didn’t know it was going to be a Christmas of “lasts.” This past year, my Uncle Steve passed away. I didn’t know it’d be my last chance to see him. My grandpa sold the house that he had lived in since my mom was a kid. Now, he and his wife live in a condo that is not big enough to hold everyone. No problem, my mom offered to have Christmas Eve at her house. Apparently, no one was planning on going except my brother’s family and I… I was REALLY bummed!! It just makes me appreciate the time I HAVE had with my family over the past year(s). As for my cousins and I, we are going to start our own traditions together (probably starting NEXT year). Well, my Mom just called me, and now, we ARE getting together for Christmas Eve. It will be a small group, just us, my brother and his family, and maybe my Grandpa and his wife. I’m glad. Christmas just doesn’t seem the same without getting together with family. Tomorrow, Jason, the kids and I will be waking up to presents from Santa, listening to Christmas music, and exchanging gifts. We will load up the vehicle with kids, the dog, and cookies. We will head over the river and through the woods, to Nana’s house we’ll go… it will be a wonderful day! As for the Christmas Story, if my Grandpa doesn’t come, I will take over as the reader of the Story! After all, that is the real reason we celebrate after all!! MERRY CHRISTMAS SARAH! I pray your new tradition with family will be a wonderful one.